Pumpkin pie has been a Thanksgiving obsession of mine for as long as I can remember. I’m OBSESSED. Thanksgiving is NOT Thanksgiving without pumpkin pie. It’s non-negotiable in my eyes. If I know this pie won’t be wherever I’m celebrating stuffing my face, I’ll bring it myself. It’s that important to me. 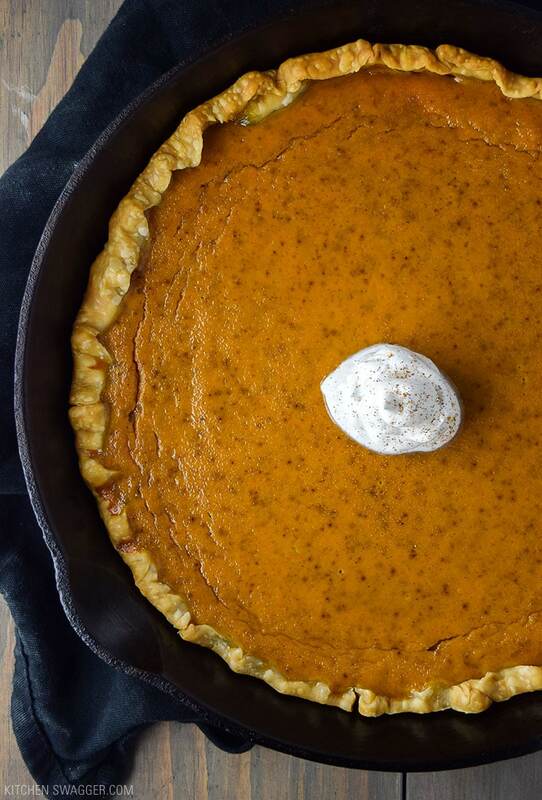 Could I skip the entire meal and only eat pumpkin pie? Probably. Well…maybe not the stuffing. 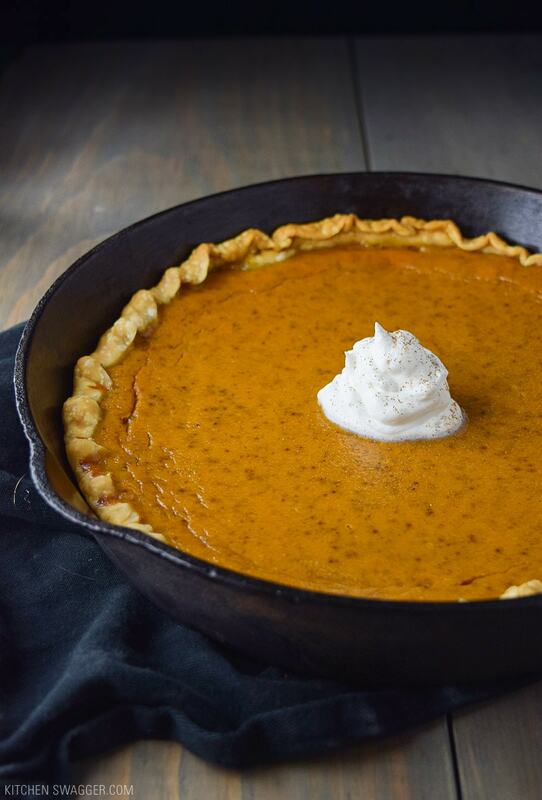 Cool creamy pumpkin on a soft crust with a dollop of delicious whipped cream. There’s no other way. 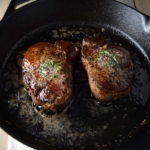 Now, I make my recipe exactly as my mom has always made it (yes it’s nostalgic for me), but my only special twist is I make mine in a cast iron skillet. 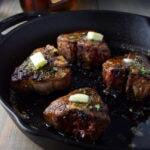 Because this is Kitchen Swagger and I do everything in a cast iron skillet. Happy Thanksgiving and happy pumpkin pie-ing! P.S. Don’t forget to save yourself (or me) an extra slice for breakfast. Mix sugar, cinnamon, salt, ginger and cloves in small bowl. Beat eggs in large bowl. Stir in pumpkin purée and sugar-spiced mixture. Slowly stir in evaporated milk. Line a greased 8-10 inch cast iron skillet with a pie crust, crimping the outer edges at the top with your thumb and index finger. Pour in pie mixture. Bake at 425° F for 15 minutes. 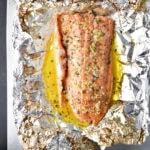 Reduce temperature to 350° F, bake for an additional 40 to 50 minutes or until a toothpick inserted near center comes out clean. Let cool on stove top for 2 hours. Serve immediately or refrigerate. Top with whipped cream before serving. 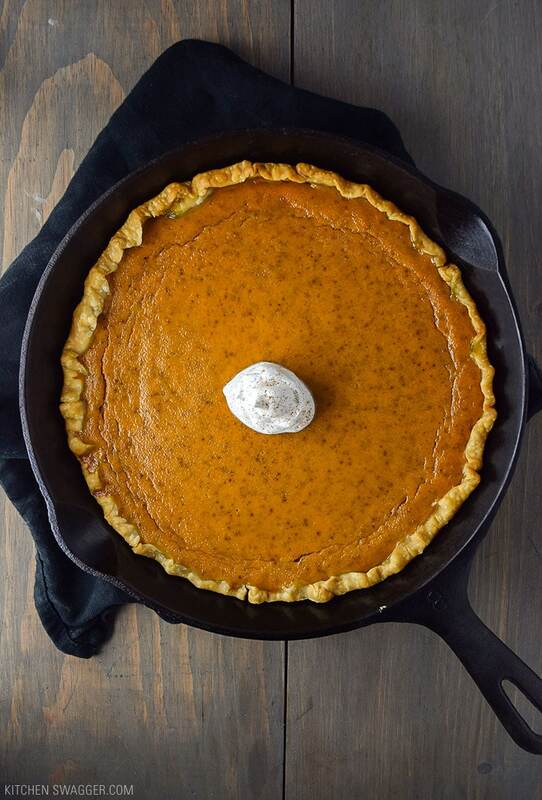 Recipe credit: LIBBY’S Famous Pumpkin Pie. Delicious pie and I did have it for breakfast too! I think it’s even better the second day! 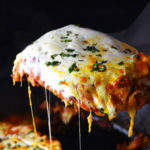 I made this last night for our Sunday family dinner and it was a huge hit! 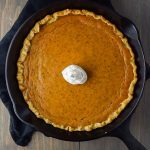 I loved making it in the cast iron skillet – the crust was so evenly baked and the pie was perfect (bummed I forgot to take a photo!) Every Kitchenswagger recipe I’ve made has been a hit with my gang, and this pie is no different! Thanks Shawn! Thanks for the kind words, Nancy. 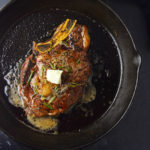 I think it’s way better in the skillet too. Glad this was a hit with the fam!